My friend Wajahat Ali is hosting the GOATMILK DEBATE series, and asked me to contribute against the motion that “muslims should adopt monsighting for Ramadan”. The initial entry, in favor of the motion, was posted earlier by Irfan Rydhan and is re-posted at Patheos. Below is my response, cross-posted at GOATMILK. 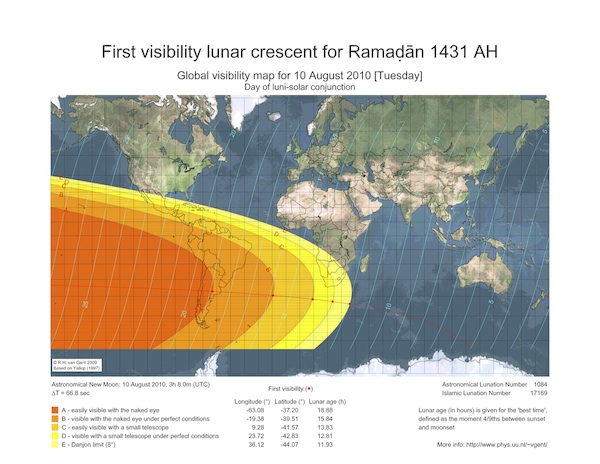 My brother Irfan Rydhan makes a compelling case in defense of moonsighting for Ramadan, and I think it is important to assert here that I do not intend to attempt to refute his case. The motion under debate is whether all muslims should adopt moonsighting, not the validity of moonsighting per se. My intention in this debate is to emphasize that there IS a valid debate about whether moonsighting is the sole method of establishing Ramadan, and to question the assumption that my brother makes, that there is some inherent value in all muslims adopting an identical practice rather than embracing the diversity of valid interpretation and traditions we have inherited as a truly global Ummah. Pickthall: And whosoever of you is present, let him fast the month, and whosoever of you is sick or on a journey, (let him fast the same) number of other days. Yusuf Ali: So every one of you who is present (at his home) during that month should spend it in fasting, but if any one is ill, or on a journey, the prescribed period (Should be made up) by days later. Note that these translations disagree with Irfan’s formulation – the actual phrase in contention is, “shahida minkumu ashshahra” where the literal translation of the words in isolation would be “witness the month”. However, note that the three most prominent translators of the Qur’an chose to translate the phrase as “is present during the month” instead. Irfan insists that “shahida” be interpreted literally as “witness” but then argues that some scholars accept a symbolic definition of “shahr” as “crescent moon” instead rather than the literal meaning of “month”. I am famously skeptical of translations, but if we must use them, why be selective on a per-word basis? Doesn’t an ayat’s meaning depend on the structure of the verse as a whole, and the context of surrounding verses? I do not fault someone for interpreting 2:185 such that “shahida” is “witness” and “shahr” is “crescent moon” as Irfan does, but other formulations such as “witness the month” and “present in the month” are at least as justifiable. Irfan also invokes a hadith to support his view. However, that hadith explains how someone may use the moon to establish Ramadan if they are trying to determine when to fast; it does not define moonsighting as the sole normative method to do so! And there are plenty of other hadith that support the use of calculation as well. Since hadith are even more contentious than translations, I don’t think there’s much point in using them to refute, only to justify. 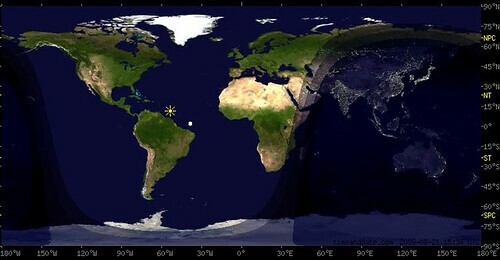 Ultimately, trying to make a theological case for moonsighting alone is a futile excercise, because there is no consensus – in 2006 the Fiqh Council of North America adopted the compromise position that astronomical calculations were indeed valid, especially as a means for ruling out physically-impossible moonsighting reports. Dr. Zulfiqar Ali Shah wrote a lengthy rebuttal to Shaykh Yusuf, pointing out that the act of witnessing the new moon itself is not an act of worship in and of itself, and is merely a means of telling time. Another thorough and scholarly essay by Dr. Louay Safi notes that the choice is not between moonsighting and calculation, but rather personal testimony and calculation. Further essays and reading material on the debate are available at the Fiqh Council’s website. Of course, Brother Irfan made his theological case by invoking interpretations supportive of his view, but it is important to remember that this debate is fourteen centuries old. As we are all muslim brothers and sisters, we are obligated to acknowledge that there are different schools of valid jurisprudence and accord them respect. But lets also note that these maps tell you the visibility of the moon from Earth, and do not comment on the actual phase of the moon itself. In fact, the actual phase of the moon is completely independent of observers on earth – it is defined by the geometry of the Sun, Earth and Moon system in space. The date of the crescent moon can therefore be precisely calculated as an objective truth, independent of flawed human reasoning and observation and geography. As the Qur’an says, “the sun and the moon follow courses [exactly] computed” by Allah (55:5). To argue otherwise is to say that if a tree falls in a forest and there is no one to hear it, it did not even fall! Leaving the issue of theology aside, what of the poetic arguments made by Brother Irfan? To be honest, these are the ones that I find most moving and compelling. There is indeed a romantic appeal in the notion of unity, and I wholeheartedly agree with my brother about the feeling of wonderment and awe when seeing the crescent moon in the sky. But why only the crescent moon? During Ramadan, the very act of looking at the moon, as it grows to full and then wanes again, is itself ibadat – for it is the visible, God-appointed marker of our brief window in which our pious actions are magnified. Ramadan’s very mortality is measured by the moon every day of the month, not just the first. I believe that our imaan is magnified not just by seeking the moon at the outset, but reflecting (no pun intended) on the meaning of the moon’s entire cycle. The precision of the calendar is not a false creation of man, but itself is a reflection of the perfection of Creation, the divinity of Mathematics, and of the vast and awe-inspiring celestial harmony that surrounds us and exists, arguably, for our sole benefit. I am humbled by the moon every day in Ramadan. And if we are to celebrate unity, as I agree we should, then let us note that there is also unity for those who observe the calendar. Those of us who abide by the calendar begin and end Ramadan worldwide in unison, akin to the unity of praying salaat behind an imam. With all due respect to Brother Irfan, it is not about getting a day off of work or Eid-day sales at the mall, but about a sincere action of faith. It is distressing that the motives of those who disagree must be impugned in such a way – I believe that causes far more disunity than the moonsighting debate itself. Let us be united – by celebrating our diversity of tradition. 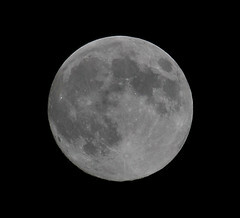 Last night was the first full moon of Ramadan – and by the calendar, the 14th of Ramadan as well. What better affirmation of the majesty and perfection of creation, than this?